For the latest twist on traditional cakes, why not create your very own Festive bite sized treats with the new Sweet Treats Cake Pops Maker, which bakes six delicious cake pops in minutes. 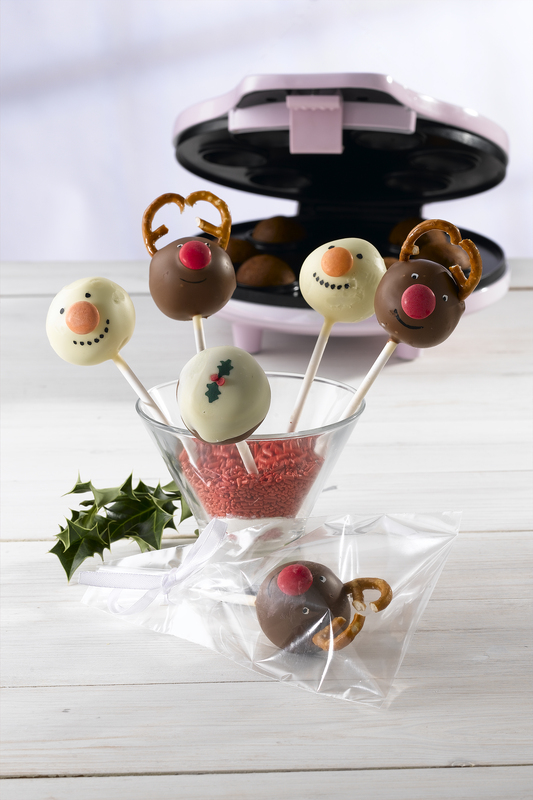 Once baked, simply add sticks to the cake pops then get creative with some festive icing and decorations. Fun to make, cake pops are Ideal for sharing with friends and family during the holidays. Try popping one into a gift bag for your guests and see how impressed they are! Making delicious cakes without having to turn on an oven sounds too good to be true, but thanks to the Sweet Treats range of electric home baking products you can turn out a variety mouthwatering cakes with the minimum of fuss - and your family will enjoy hours of baking fun in the kitchen into the bargain. Sweet Treats includes a Mini Cup Cake Maker, a Whoopie Pie Maker; Brownie Maker; Cake Pops Maker; Brownie Bites Maker; Zoo Waffle Maker and a Popcorn Maker – perfect for indulging any sweet tooth, and great for gift inspiration too! How does the Cake Pops maker work? The new Sweet Treats Cake Pops Maker is as easy to use as a sandwich maker – just plug in and the lights indicate when it is ready. For best results, simply prepare your cake mix using the handy recipes that come with the product and then pop into the non stick holders. Close the lid and your delicious Cake Pops are ready in minutes. Allow them to cool, then have fun decorating with your favourite tasty toppings – you might have to try more than one bite, to see just how delicious they are! Whatever your sweet tooth desires, you won’t be disappointed with the range of products that Sweet Treats has come up with, not to mention lots of recipes ready to inspire you to create delicious snacks and desserts for family and friends – enjoy! •	‘Sweet Treats’ is a range produced by MPL Home – who also produce and market Gordon Ramsay kitchen appliances plus other leading home wares and home furnishings. This press release was distributed by ResponseSource Press Release Wire on behalf of Dianne Kenyon Communications in the following categories: Home & Garden, Women's Interest & Beauty, Food & Drink, for more information visit https://pressreleasewire.responsesource.com/about.